This week we did some sampling of of the Jetset Energy mixer trio. Jetset Ginger Ale: Jack Daniels was the selected spirit to compliment this fine mixer. Before mixing with the Jack a quick sip revealed a crisp taste with no aftertaste or film on the tongue. Jetset Tonic: Tanqueray gin was used to sample this tonic and this was a great combo. Jetset Club Soda: I am not a club soda drinker so i can’t tell what is good or bad but it mixed well with some cranberry juice I had! We have a new twist on the club scene for energy drinks…. move over Red Bull and vodka! This entry was posted in Caffeine, Guarana, Taurine and tagged club soda, energy, ginger ale, jetset, tonic on September 26, 2008 by Enery Drink Guru. 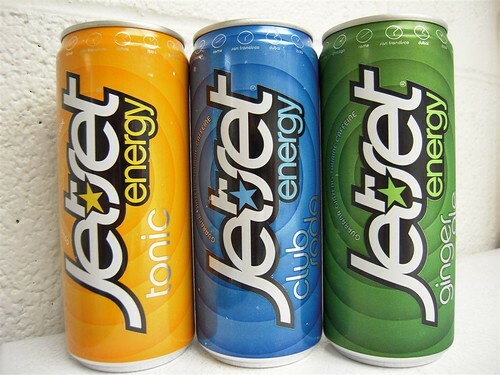 Jetset Energy Drinks and Energy Mixers are available in California and Arizona. It is distributed by Southern Wine and Spirits. Is is sold in select clubs and bars Safeway, Vons, Bevmo and Fry’s. Look for it in the mixer aisle and next to Skyy Vodka in the Spirits Aisle. That is a pretty sweet idea! Can you post where to find these mixers please?